Preheat the oven to 350°. Spread the almonds in a pie plate and toast for 8 minutes, until fragrant and golden. Let the almonds cool, then coarsely chop. In a large saucepan, cover the wheat berries with 8 cups of water. Add 2 teaspoons of salt and bring to a simmer. Cook the wheat berries over moderate heat until tender but still chewy, about 45 minutes. Drain well. Meanwhile, in a large, deep skillet, heat the olive oil. Add the onion and cook over moderate heat until slightly softened, about 3 minutes. Add the cauliflower and cook over moderately high heat until it begins to brown, about 6 minutes. Add the chicken broth, cover and simmer over moderate heat until the cauliflower is just tender, about 5 minutes. Uncover the skillet and cook until all of the broth has evaporated but the vegetables are still moist, about 5 minutes. Remove from the heat and stir in the butter. Season with salt and pepper. 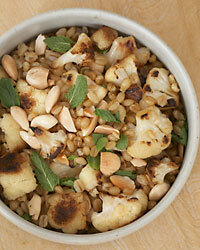 In a medium bowl, mix the wheat berries with the cauliflower, toasted almonds and mint and season with salt and pepper. Serve warm or at room temperature.